Thanksgiving represents a host of different traditions. The holiday weekend also brings special significance for many Montanans: the last few days of hunting season, which means we have just a few more days to fill our tags. My family usually combines these two traditions by spending most of Thanksgiving Day in a last-minute sprint to harvest the animals that allow us to enjoy fresh, affordable meat for the rest of the year. Coming up onto the knob at first light. And that was the scene on this Thanksgiving Day as well. My alarm went off at 5 a.m. By 5:30 a.m., my parents and I had made the short drive to the back of the ranch and were trekking up the mountain behind our house. It was still pitch dark. The wind howled as the snow came at us sideways. Mom needed to fill her tag for a mule deer buck in a heavily regulated trophy block. With just 25 of tags available for the block, she was lucky to pull it and wasn’t about to let it go unfilled. It takes about an hour-and-a-half to hike to the top of the knob where we like to sit. Dad has the timing perfected. On a clear day, it is the perfect place for spotting any wildlife that passes through the 7,500-foot deep bowl of meadows and timber below. But this past Thanksgiving Day, the blinding snow and 30 mph winds that greeted us at the top were brutal. Dad peered through his binoculars, but he could barely see the ridge just 500 yards across from us. I was most certainly not prepared. My hands froze up and went numb as the nausea that comes with unbearably cold temperatures set in. We suffered through the next few hours hoping that something would show itself. Walking through the timber in search of a large mule deer buck. Eventually, we made our way back down into the heavy timber. Mom decided to pass on the one small buck that crossed our path. Given the harsh weather, Dad thought it best to switch gears and head across the valley to an area where he had seen some elk the day before. Fingers numb, I decided to stay home and work on dinner. It was clearly going to be an especially long day. My family’s Thanksgiving dinner may seem unconventional to some. The meal usually doesn’t get started until well after 5pm depending on the events of the day. Dress is definitely casual. I wore work pants, a sweatshirt, and my hunting hat. My parents were still wearing their camo. But this is our family tradition and it is always a wonderful time. Nothing beats spending the day outdoors with your family, then tying it off with an incredible meal. Some years, it is just the three of us. Other years, friends or extended family join us. Either way, I am grateful to have the day together, doing the things we love. Unfortunately, we didn’t harvest any animals on Thanksgiving Day. After dinner, as we lay on the couch in a food coma, we spent the evening plotting the rest of the weekend. There was still time to ensure we’d have fresh meat to enjoy throughout the year. Mom and Dad walking back down into the valley and back home to switch gears and look for elk. For many Montanans, hunting is a Thanksgiving Day tradition. If you had the opportunity to enjoy an outing with your family this year, hopefully you fared better than we did. Either way, we hope you enjoyed a happy Thanksgiving. Got something to say to Prairie Populist? Send news tips, story ideas and comments to editor@prairiepopulist.org. If you have something to submit, or an idea for a story you’d like to write for us, check out our Submission Guidelines here. Grizzly Bears... I bet we’ve got your attention now. 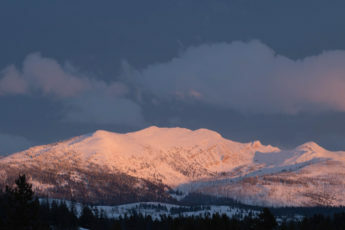 Could Montana Afford a Federal Land Transfer? Montana’s Ag Resilient as Summers Heat Up -- But for how long? The Apprentice, Montana Edition: You’re hired! Prairie Populist isn’t right or left, red or blue. We just want you and all of us here in Montana to prosper. We hope you join us.